The second lyre is named for the interlace pattern on its headstock. The last lyre had two dragon heads, so it’s the Dragon-head lyre. Simple. Number Two is made completely of mahogany. 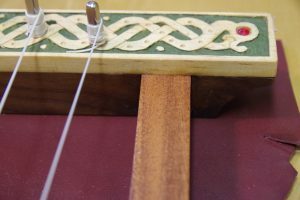 The Sutton Hoo lyre was oak and had no sound holes. So, it seems as if the original makers relied on the sonority of the box itself to carry the sound waves. 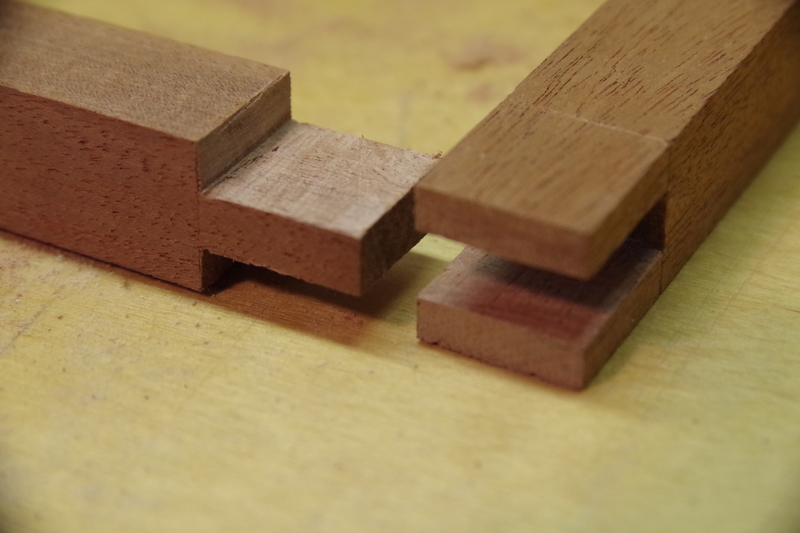 That means paying close attention to grain direction and keeping the joints tight. 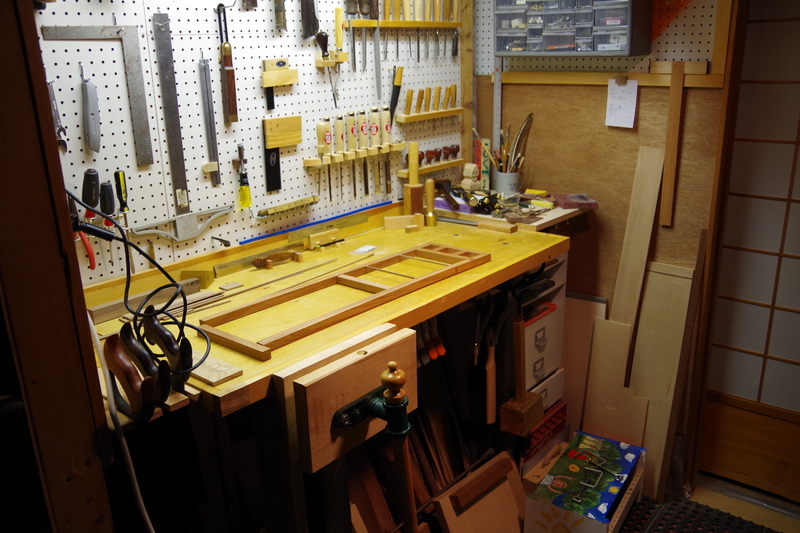 I decided on a frame, much like a tortion box, but with the head stock exposed. 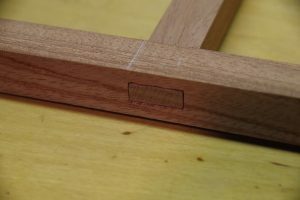 The frame is 3/4″ x 3/4″ mahogany. There are two main points of potential warp: torque on the cross-beam and tilt on the base. The headstock is so heavy and the string pins so thick that tilt is unlikely there. So, joinry type will be chosen to account for that. 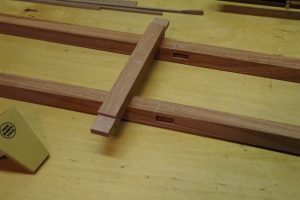 The main crossbrace is joined with a through-tenon. 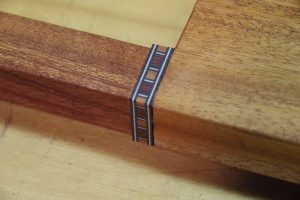 If it is seated in the mortise well, then the brace won’t tilt (or roll) forward or backward, causing the lyre’s skin to buckle. You can see that it’s pretty well seated. There’s a little daylight, but I filled that with epoxy. 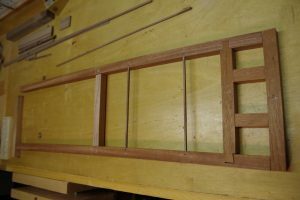 All the main structural joints are epoxied. The base of the lyre is going to anchor the force of the strings, like the anchorage of the Brooklyn Bridge. So the main counterforce, it seems, has to be against tilt (or roll). 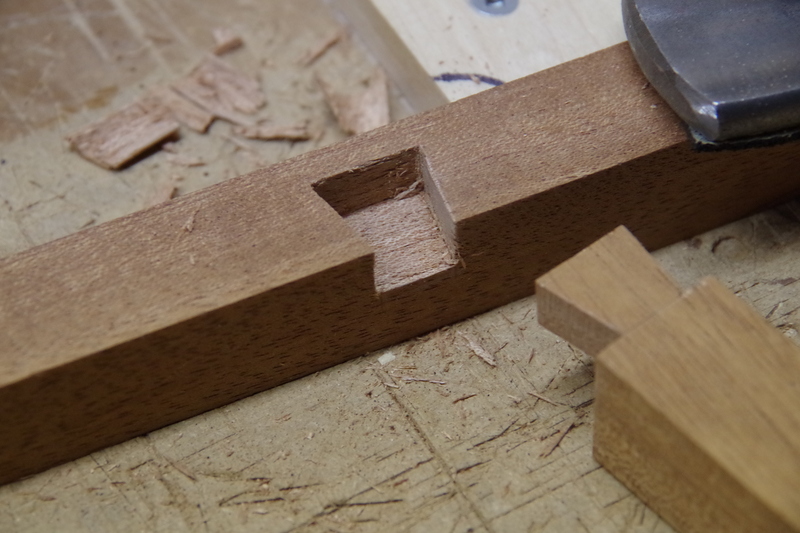 So I decided on a bridle joint. I also wanted a lot of exposed long grain for glue. 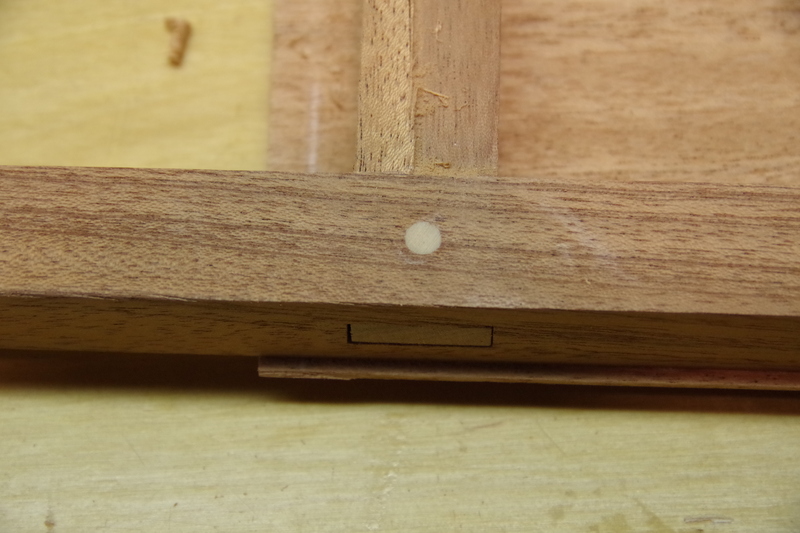 I kept the proportions of the joint to thirds, which left enough wood to sustain the pressure. 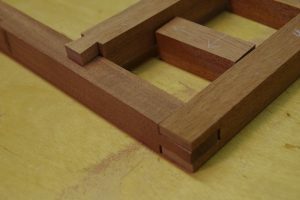 Even with as hard a wood as mahogany, I wouldn’t make the frame any thinner. Next, I wanted to reinforce the base with a secondary brace that would also support the bridge. 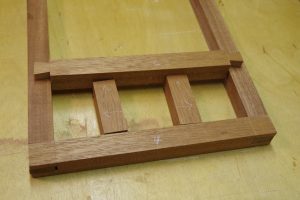 To counteract both tilt and torque, I decided on a half-lap dovetail to secure the brace to the sides, and mortise and tenon to secure the stiles. 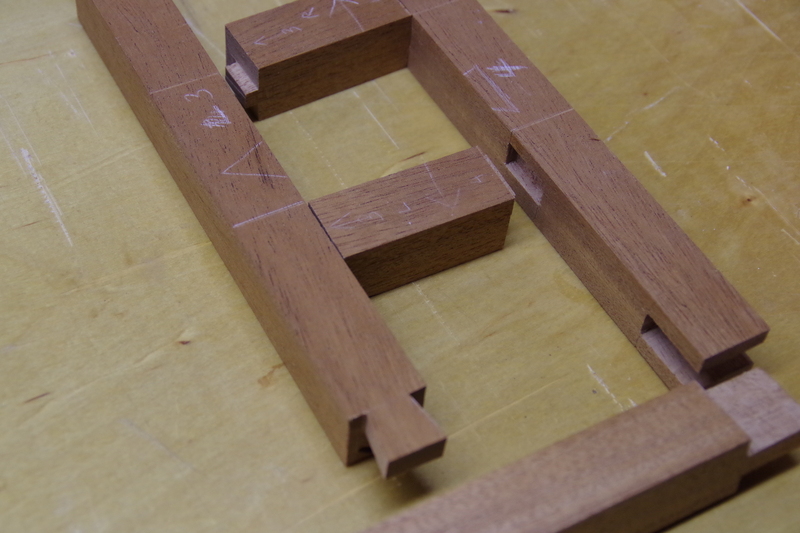 I used regular wood glue for the crossbrace assembly, since the joints are doing most of the work. 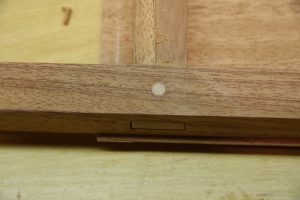 In the picture above, you can also see the mahogany skin. 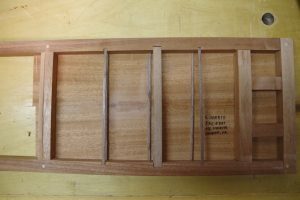 I skinned one side with 1/16″ mahogany veneer. 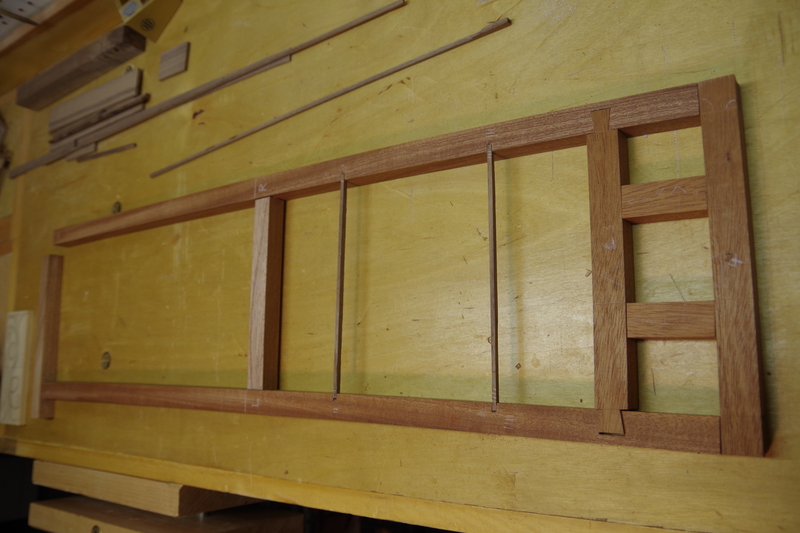 It was too thin to support anything structurally, so I put nto a series of very thin supports. These were walnut. 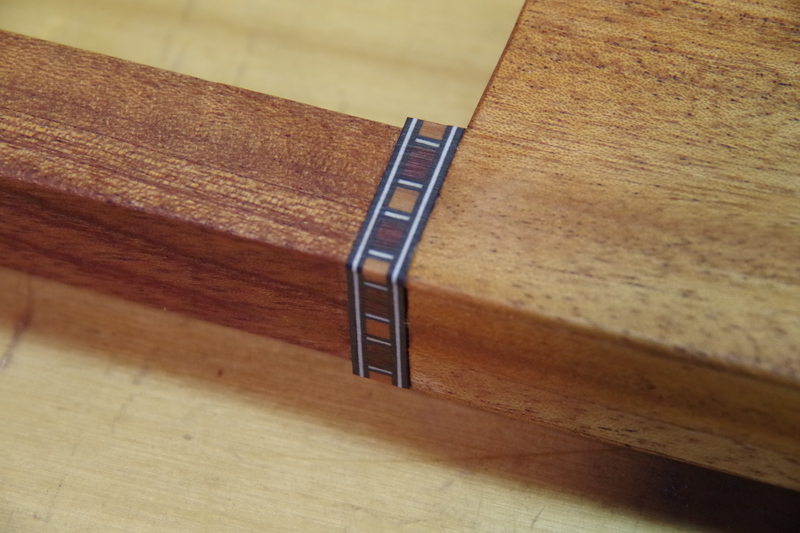 I wanted something with closer grain than mahogany, both to avoid splintering and to carry high-frequency sound more efficiently. After all that work and all those beautiful joints, one is tempted to show it off–very Greene & Greene! But a clean aesthetic demands otherwise, so I hid the joinery. I don’t have pictures of carving the headstock, but you can see it in the following video. (I made the video so you can hear the sound.) The saddle is a strip of walnut that spans the mahogany skin and supports a mahogany bridge. 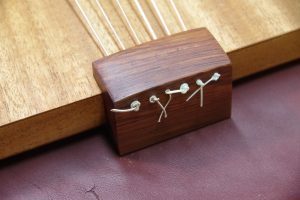 The tailpiece is mahogany and clutches the body like a c-clamp. 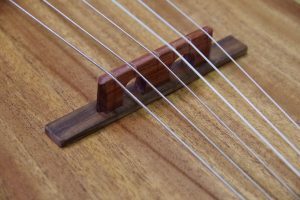 The strings are sent through holes and their ends are tied, like a classical guitar. The tuning pegs are zither pegs, tuned with a handle.